On a chilly December morning in Bow, a working-class area in London's East End, a landlady unsuccessfully attempts to rouse a tenant whose door is locked and bolted from the inside. The alarmed landlady calls upon her neighbor, a retired Scotland Yard detective, who breaks down the door to reveal... read more the tenant with his throat cut and no weapon in sight. "It seems clear that the deceased did not commit suicide," the coroner declares at the inquest, adding, "It seems equally clear that the deceased was not murdered. 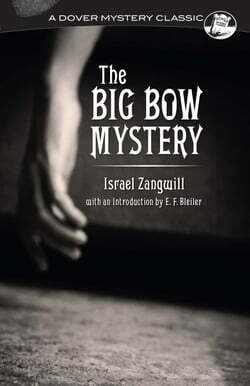 "So begins Israel Zangwill's darkly humorous mystery, which marked a turning point in detective fiction. Sealed-room mysteries had appeared before, but this inventive tale offered a novel exploitation of the genre's puzzling possibilities. The 1891 publication was serialized in the London Star, a tabloid notorious for its sensational coverage of the Jack the Ripper murders. Between installments, Zangwill engaged in a lively dialogue with his readers, who proposed solutions to the crime (none of them correct). As Publishers Weekly noted, "With a sardonic style and vivid, Dickensian characterizations of Victorian-era London, Zangwill still appeals to contemporary readers."